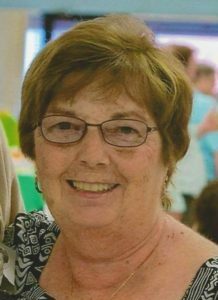 Donna L. Peters, 70, of DeKalb Junction, died on May 11, 2017, at her home. There will be calling hours, June 24th, 2017, 1 – 4 PM, a Memorial Service will follow, Pastor David Hart officiating. She is survived by her husband, Joseph H., sons, Jeff Peters of DeKalb Junction, Michael and his wife Nancy Peters of Hermon, Steven and his wife Karen Peters of Denver, Colorado, a brother Charles Powell of Canton, sisters, Caroline Conklin of Chenango Bridge, Roxanne and her husband David Bigelow of DeKalb, Debra and her husband Rick Johnston of Gouverneur, grandchildren, Adam Peters, Jon Peters, Emily Peters, Jim Peters, Lucas Peters and Seth Peters, several nieces and nephews. Donna was born on October 27, 1946 in Gouverneur, the daughter of the late Roger and Bridgette McNally Powell, she graduated from Hermon DeKalb Central School. She married Joseph Peters on September 4, 1965 at St. Henry’s Church, DeKalb Junction. Donna was a clerk/bookkeeper at SUNY Canton before retiring, prior to that she was a clerk at Jubilee in Canton. She volunteered at Maplewood Campus in Canton and at the Gouverneur, St. Lawrence County Fair. She was a past member of the Old DeKalb Grange and a parishioner at St. Henry’s Church. In lieu of flowers contributions can be made to the DeKalb Junction Volunteer Fire Department, 4323 USH 11, DeKalb Junction, New York, 13630 or the SPCA. Uncle Joe, Jeff, Mike, Steve and Grandchildren. As a niece and a friend to Donna she will missed. We all have a loss, but good memories to get us through. Diane P.